Patch 7.11 is here and it looks like the Age of Kassadin has returned. His early game may still be lackluster, but once he hits level six and picks up a Rod of Ages, it's only a matter of time before he puts the enemy team in shutdown mode. Meanwhile, the love taps on Caitlyn and Zac don't seem to be doing much, and Malzahar (mid) looks like he's doing much better after the tweak, at the sacrifice of Malzahar support's potential. Meanwhile, the love taps on Caitlyn and Zac don't seem to be doing much, and Malzahar (mid) is doing much better after the tweak, at the sacrifice of Malzahar support's potential. Ahri [God Tier Mid] - Ahri's beginner-friendly nature took a hit this patch with her numbers shifting over from her no-aim Fox-Fire [W] and Spirit Rush [R] spells over to her Charm [E]. However, the things that made her strong to begin with are still largely intact; namely her low cooldown triple flash with AOE damage and her powerful waveclear via her Orb of Deception [Q]. Caitlyn [God Tier Marksman] - Prior to this patch, Caitlyn was a bit broken, and after this patch, well, she's still a bit broken. There's not much else to say, but the removal of the headshot passive from Hurricane was always more of a late-game factor, whereas Caitlyn's early to mid-game dominance is still very much present. Fizz [Tier 2 Top] - After the last few rounds of nerfs, top lane Fizz is performing terribly on paper. In practice, he can still snowball hard a few games, but AP Fizz definitely seems like the way to go. Players still trying to make bruiser tank Fizz work will generally find some difficulties staying relevant as the game progresses. Graves [Tier 2 Jungle] - At higher divisions, Graves is still very decent, and can snowball given the right circumstances. However, treat him as a close-range glass cannon, which makes it difficult for less skilled players to pick him up as his margin for error is very low. Kassadin [God Tier Mid] - After nerfs after nerfs on other mid-laners, it's finally time for Kassadin to shine again. 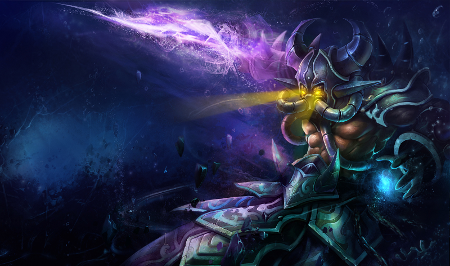 Do you miss getting the 0-2 Kassadin roaming at level 6 for double kills? Can't say I do. Unfortunately for the both of us, he's back and it looks like he's here to stay. Lulu [Tier 1 Support] - After the nerfs, Lulu is still very much playable, but feels fairly balanced compared to the other supports in a solo queue setting. She's still strong, but I don't think she's ban-worthy anymore. Malzahar [Tier 1 Mid] - Buffing Malzahar's Call of the Void [Q], Malefic Visions [E],and Nether Grasp [R] amplified his guaranteed damage. The delay reduction on his Q also made it much easier to hit, resulting in a more oppressive laning phase and a more consistent crowd-control. Malzahar [Tier 3 Support] - Malzahar's support abilities took a big hit this patch after the reworked damage on his Nether Grasp [R], resulting in less free scaling. The shift to ability power and reduction in voidling damage also knocked him down a few pegs. I don't think he's worth playing as a support at this point. Rek'Sai [Tier 2 Jungle] - Rek'Sai's rework makes her feel a lot more interactive, but her numbers aren't showing good results so far. I think her kit idea is fine as is, but needs a few more buffs in terms of numbers to make her viable. Zac [God Tier Jungle] - The 0.25 second faster visual indicator on his Elastic Slingshot [E] is basically a nonfactor in terms of reducing his overall power as a champion, and he continues to soundly dominate the rift.